Pearl Jam has never been a band that shied away from speaking its mind, waging open war against Ticketmaster in the 1990s, and putting the Jeremys of the world on blast pretty much forever. 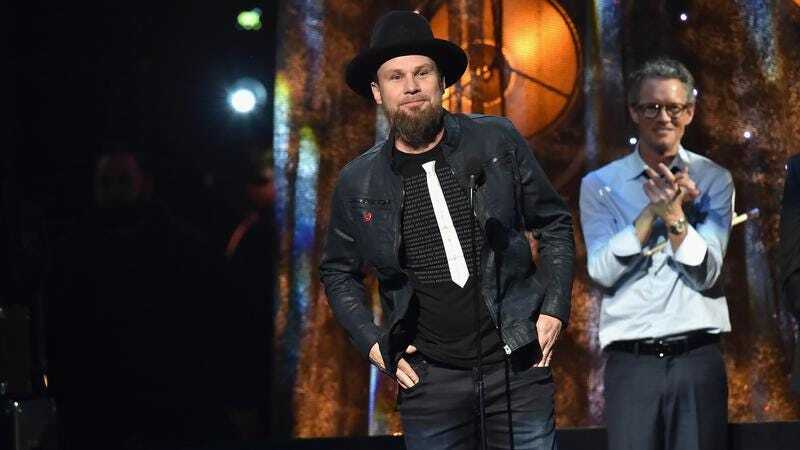 So it’s no surprise that when the band’s bassist, Jeff Ament, took the stage at last night’s Rock And Roll Hall Of Fame induction, he couldn’t help but wear some criticisms of the institution’s practices on his sleeve. Or rather, on his chest; it turns out that Ament’s shirt was covered in the names of great artists who’ve been ignored by the Hall, from Brian Eno to founding Nirvana drummer Chad Channing. Ament spoke briefly about the need to acknowledge a wider crop of stars in his speech, but his shirt spoke way louder. The band later posted a close-up picture of Ament’s shirt on Instagram, both suggesting that the other members endorsed his message, and giving the rest of us a chance to actually read it. Ament isn’t the first one to point out that the Hall’s selection criteria misses a lot of amazing artists. Steve Miller said as much last year, as part of his numerous complaints about the ceremony. Meanwhile, conservative critic Doug Heye just wrote a piece in The Hollywood Reporter, pointing out the Hall’s English-language-heavy focus, and calling for the inclusion of Johnny Hallyday, “The French Elvis,” among others.